Nail gun injury legal help. File your complaint with a nail gun lawyer. Nail gun injuries are potentially life-threatening accidents that can result in serious harm to the victim. Because nails are designed to pierce and penetrate material, nail gun accidents can penetrate the victim's skin, putting him at risk of internal injuries. Despite warnings from doctors and researchers, nail guns are available at hardware stores so even inexperienced, "do-it-yourself" carpenters can use them. The lack of experience, combined with the force of the nail gun and a lack of proper safety controls on some nail guns, puts consumers and workers at risk of a serious nail gun injury. 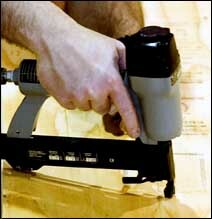 Send your Nail Gun Injury claim to a lawyer who will review your claim at NO COST or obligation. Nail gun sales have increased in the past decade due to the building boom, and so have nail gun injuries. According to the US Bureau of Labor Statistics, California companies alone reported 1,890 nail guns injuries from 2003 to 2006. Nationwide, approximately 37,000 people [including workers and consumers] each year are treated at hospital emergency departments, according to the Centers for Disease Control and Prevention. Doctors and researchers have been warning consumers for decades that nail guns are dangerous, especially in the automatic mode known as "contact trip" [in which the nail gun fires when both the trigger and the nose of the gun are pressed down], yet little has been done to promote more stringent safety measures. Powered by compressed air, nail guns are capable of firing 30 nails a minute, up to 10 cm into concrete, at speeds as high as 490 feet per second. In the contact trip mode, one trigger pull can cause serious harm. Nail gun injuries can occur when a nail ricochets, when a nail gun is misused, if the operator has insufficient training, or if both of the activation mechanisms--usually a safety wire at the muzzle and the trigger--are unintentionally depressed at the same time. According to an analysis conducted by researchers at Duke University Medical Center and the National Institute for Occupational Safety and Health, between 1991 and 2005, the number of "weekend carpenters" (consumers) treated for nail gun injuries each year in US hospitals more than tripled. By 2005, approximately 14,800 consumers were seen in emergency rooms each year. The study, published in the April 13, 2007 issue of Morbidity and Mortality Weekly Report, found that 96 percent of injured consumers were male, with an average age of 35. Meanwhile, the Centers for Disease Control and Prevention (CDC) found that in 2005, 28,600 workers were injured by nail guns. Of those, 1,500 workers suffered wounds serious enough that they were admitted to the hospital. The CDC reports the most common type of nail gun injuries involved injuries to the upper extremities, specifically the hands and fingers. Lower extremities were another common site of nail gun injury. In some extreme cases, victims have died from nail gun wounds. Depending on the circumstances surrounding a nail gun injury, the victim may have options concerning compensation for the injury and any monetary damages. If the victim was working when the injury occurred, he may file a workers' compensation claim. If his accident was the result of negligence on the part of his employer or manager—for example if there were inadequate safety measures at the worksite, if the safety switch was removed from the gun or if the employee was injured due to lack of training—then a lawsuit could be filed against the employer and/or managers. If the injury was the result of a defective nail gun, the company that manufactures the defective product could be held liable, regardless of whether the injury occurred to a worker or to a consumer, such as a "weekend carpenter." Product liability lawsuits have been filed against nail gun makers and juries have found nail gun manufacturers guilty of negligence in marketing unreasonably dangerous tools. In one lawsuit, Stanley Works, the manufacturer, was ordered to pay $3.4 million to a construction worker who suffered seizures and paralysis after a nail from the gun was embedded in his brain. If you or a loved one has been hurt or injured when using a nail gun you may be eligible for compensation. Please click the link below to submit your nail gun complaint to a nail gun lawyer for a free case evaluation.